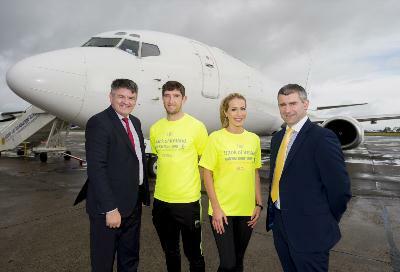 Shannon, Ireland, 2015-5-8 — /Travel PR News/ — One of Ireland’s most unique mass participation sports events of the year, the Bank of Ireland Runway Night Run at Shannon Airport, has got lift-off again, with this year’s event set forFriday, 19th June 20th at midnight. Following the huge success of last year’s first ever night-time run at an Irish airport – registration for which had to be closed days ahead of the event after its 1,200 places were snapped up – the sequel will see an extra 500 places released this year to satisfy demand. However, those intending taking part in the novel event are being advised to register early.Registration opens this Thursday, 7th May at noon on www.sportstiming.ie and will close at noon on Monday, June 15th, but the event is expected to sell out long before this. Full details available on www.shannonairport.ie. All proceeds from the event – registration fee is just €20, plus booking fee of €1.40– are going to Shannon Group plc’s chosen charities for 2015 – Tipperary Limerick Clare for Cystic Fibrosis (TLC4CF) and Milford Care Centre, Limerick. On hand to launch this year’s event were GAA pundit and victorious Tipperary All-Ireland winning Manager Liam Sheedy, who is Area Manager, Mid-West Region for Bank of Ireland, and three-time Kerry All-Ireland medal winner Killian Young, Bank of Ireland, Tralee, Youth Co-Ordinator Kerry/West Cork. Participants will be asked to arrive at Shannon Airport for the event 90 minutes before the scheduled start-time to allow for registration and take part in the fun-warm up session delivered in the terminal building by ‘Mr Motivator’ Richie Clifford. Commenting Liam Sheedy, Area Manager for the Mid West with Bank of Ireland said “We are delighted to sponsor the Bank of Ireland Runway Night Run at Shannon Airport again this year. Last year’s event was a huge success with so many people taking part. This is a fantastic fun and unique event which will help raise awareness and much needed support for this year’s two chosen charities Tipperary Limerick Clare for Cystic Fibrosis (TLC4CF) and Milford Care Centre, Limerick. This entry was posted in Airports, Festivals and Events, Travel Marketing and tagged Bank of Ireland, Neil Pakey, Shannon Airport, The Bank of Ireland Runway Night Run. Bookmark the permalink.